Though tornadoes have touched down in almost every country in the world, the greatest number of tornadoes shows up in the United States. And this isn't just coincidence, — there's a scientific explanation for why it happens. Why does it seem like the United States gets more tornadoes than the rest of the world? Is it because tornadoes abroad don't make our news or conditions here are "better?" Although strong tornadoes have been observed in all continents except Antarctica, the central US is the place where strong tornadoes are more likely than anyplace else. This is because of the Rocky Mountains and the Gulf of Mexico. Surface winds out of the south bring in warm, moist air at low levels and winds aloft out of the west bring in relatively cold, dry air above that from coming over the wide high range of mountains and High Desert that forms a long north-south barrier. The temperature and moisture profile brings in the right conditions for thunderstorms and the change of the wind with height means storms will rotate. No place else on the planet combines something like the Gulf/Caribbean area with the Rocky Mountains to make it relatively easy to make tornadoes. Of course, though the U.S. gets the most tornadoes, at an average of just over 1,000 a year, there are plenty of other countries that still get hit by tornadoes in high numbers or with extreme force. 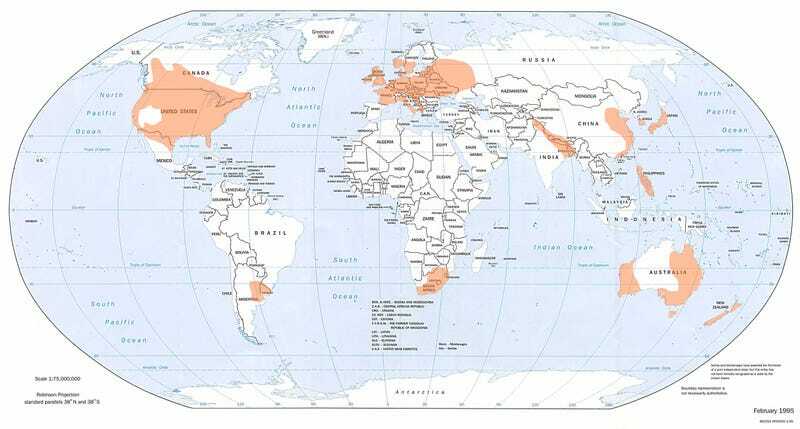 A fact you can see demonstrated by the map above from NOAA, showing which areas of the world, including the U.S., experience the greatest likelihood of tornadoes.